This spring a swarm of honeybees showed up and took over this aging hive in the edge of the woods at my neighbor’s farm. It’s been several years since the previous inhabitants abandoned it. They left for no clear reason that could be seen. 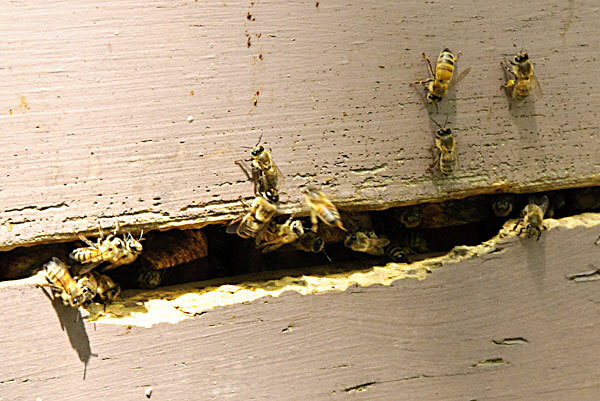 Bees do that sometimes, when the queen dies or is weak, or some other circumstance sends the community in search of a different home. There’s no clear reason either why it sat empty several years, then suddenly was deemed habitable by this new community. 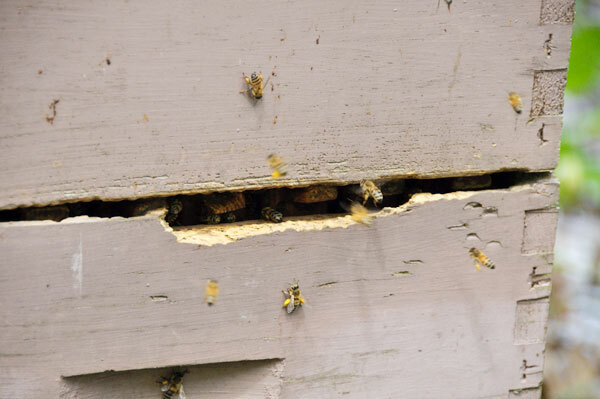 Battered and chipped, the hive boxes remind me of the old houses in faded neighborhoods I’ve known. Still standing, though the porch sags, the roof leaks. The inhabitants hurry about, living their lives, making a home from the empty space beneath the roof. 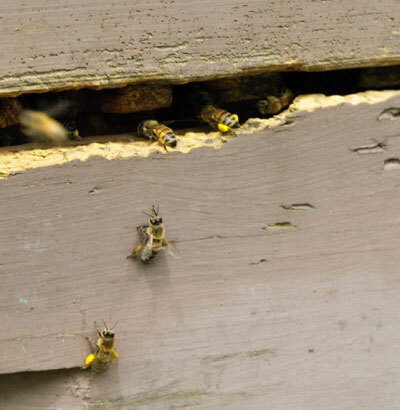 Those bright yellow blotches on the bees’ legs are fresh pollen. It’s a good season for pollen here, from the point of view of the bees, I suppose. They’ll have honey in that hive soon enough, but probably not enough to share with humans. A new settlement like that needs food to feed their workers and brood, and to carry them through the lean seasons. 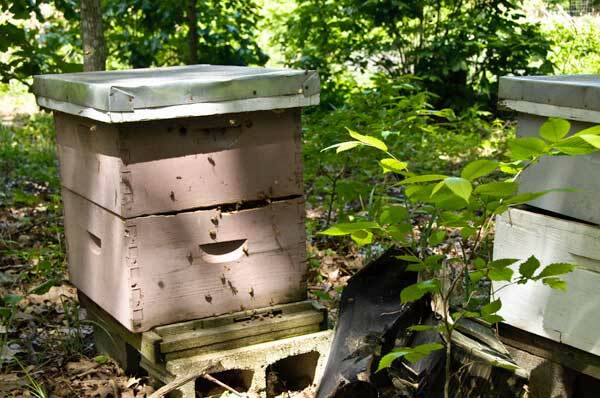 Another season, when the hive is stronger, it might be all right for the humans to claim a share of the honey and call it rent, payment for the use of the hive structure. 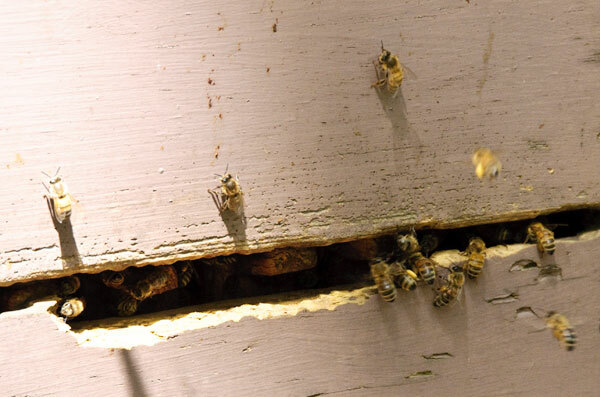 Dozens of bees entered and left through the gap between the boxes. We watched the hive for about five minutes, standing less than six feet away. The bees ignored us. We posed no theat, and they had more important things to do than to bother with humans who stood around, wasting time and contemplating this change in the neighborhood. I suspect if I worked as hard as the bees, I’d get a lot more done around here.